Overview - Hong Kong, 1962: Chow Mo-wan (Tony Leung Chiu-wai) and Su Li-zhen (Maggie Cheung Man-yuk) move into neighboring apartments on the same day. Their encounters are formal and polite—until a discovery about their spouses sparks an intimate bond between them. At once delicately mannered and visually extravagant, Wong Kar-wai’s In the Mood for Love is a masterful evocation of romantic longing and fleeting moments. With its aching musical soundtrack and its exquisitely abstract cinematography by Christopher Doyle and Mark Lee Ping-bin, this film has been a major stylistic influence on the past decade of cinema, as well as a milestone in Wong’s redoubtable career. What does romance look like? It's an abstract concept, after all, open to many different interpretations –- but if one could somehow distill the very essence of passion and sensuality into actual images, what would take shape? Filled with visuals that ache with a palpable sense of longing and desire, Wong Kar-Wai's 'In the Mood for Love' presents a possible answer. Though he's famous for his jazzy, improvisational style, the film is actually among the director's most methodical efforts, presenting a tightly focused, streamlined exercise in cinematic expression, that still manages to retain a certain free-flowing elegance. Gorgeously photographed, impeccably performed, and fueled by an almost haunting lyricism, the movie is arguably the celebrated filmmaker's very best work, and remains a genuine masterpiece of world cinema. Set in Hong Kong during the early 60s, the story focuses on Mr. Chow (Tony Leung) and Mrs. Chan (Maggie Cheung), two neighbors in a small apartment building. Though both are married, they rarely see their spouses and soon suspect that their significant others may actually be having an affair –- with each other. Together, the jilted lovers bond over their mutual turmoil and slowly but surely find solace in their burgeoning friendship. Determined to avoid the same illicit mistakes of their partners, they struggle to keep their relationship platonic, but restrained passion can only be caged for so long. In my review for one of Kar-Wai's earlier films, 'Fallen Angels,' I elaborated on my love/hate relationship with the director's improvisational approach to scripting. Kar-Wai often begins productions without a completed script, and instead prefers to start with a rough outline that gradually evolves over the shoot. In the past, this has led to an energetic and wildly unpredictable style that results in very loose, and at times slightly muddled storytelling. While 'In the Mood for Love' features this same improvisational production method, the outcome is actually much more controlled and concentrated than the director's previous efforts. Over a grueling 15 month shoot, Kar-Wai slowly whittled down to the very core of his concept, excising extraneous material while re-shooting sequences until he developed a truly singular tone and almost minimalist narrative. This lends 'In the Mood for Love' a level of cohesion that's not always found in the director's other films. Thankfully, this measured cadence to the storytelling doesn't come at the sacrifice of Kar-Wai's trademark experimentation and impressionism. In many ways, the film presents a honed in refinement of the director's style –- one that he hasn't been able to fully replicate since. On the surface, the story is exceedingly simple, and in reality there aren't many traditional dramatic beats. The brunt of the runtime is made up of understated interactions between Mrs. Chan and Mr. Chow as they attempt to playfully reenact the circumstances behind their spouses' adulterous actions. Though very interesting in its own right, this narrative becomes the mere framework for much deeper artistic expression. As its title implies, this is really a film about mood. A powerful air of longing permeates throughout the work, gently flooding the screen with whispered romance. While the simple story is engaging and thematically rich, the images themselves are the real focus here –- and they absolutely ache with beauty. Rhythmic and meticulously composed, the film's visual style is utterly mesmerizing. Obstructed views, low angles, and fly-on-the-wall perspectives all help to engender an intimate aesthetic that fully integrates the camera into the characters' world. Objects and locations are used to re-frame actors within shots, bolstering the movie's close sense of space. Drifting camera movements create an ethereal atmosphere, and slow motion montages set to a haunting score carry an impressionistic sense of motion. Experimentation with shutter speeds lead to stuttering images that prolong emotional moments, while dreamlike close-ups of small details -- like a rising plume of cigarette smoke –- help to punctuate scenes with stirring visual poetry. Repetition also plays a huge part in the movie's structure, and Kar-Wai uses repeated visual motifs, music cues, angles, and situations to develop a unified, lyrical syntax in his filmmaking. As sumptuous as the film's visuals are, they'd be merely empty style without the necessary substance and heart to back them up –- and serving as the last piece in the cinematic puzzle that bridges the movie's minimalist story and striking images together, are Tony Leung and Maggie Cheung. Together, they turn in startling performances layered with subtlety and complexity. Products of the formalities of their time, both characters are forced to hide their true wounded emotions beneath polite exteriors. Overwrought with loneliness, they yearn for each others company, but their feelings are not expressed in explicit gestures, drawn out conversations, or overt love scenes. Instead, Leung and Cheung mostly convey their emotions through subtle body language and fleeting glances. Through understated and perfectly balanced performances, they are able to communicate so much with so little. Likewise, in a key directorial decision, we never actually see the pair's cheating partners. Not completely, at least. Through Kar-Wai's lens they are merely faceless entities and disembodied voices –- further concentrating the focus on Mr. Chow and Mrs. Chan and their bittersweet dalliance with love. What does romance look like? Billowing red drapes fluttering slowly in an empty hall bathed in vivid hues. Two hands gently clasping together, fearful of ever parting once again. A woman's head softly drifting down atop a man's shoulder, where it briefly rests, peacefully suspended in time. Full of delicate sensuality, Wong Kar-Wai's 'In the Mood for Love' captures the intangible ecstasy and torment of restrained passion, giving cinematic form to yearning and desire. Rhythmic and deeply layered, its story, style, and performances work harmoniously together to create a lasting artistic achievement. It's lyrical, hypnotic, and strikingly beautiful –- a bittersweet secret whispered from melancholy lips. 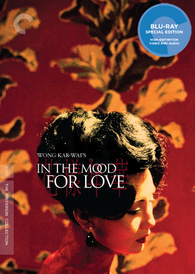 Criterion presents 'In the Mood for Love' in their standard clear case with spine number 147. The BD-50 Region A disc comes packaged with a booklet featuring an essay by critic Steve Erickson, and the Liu Yi-chang short story that inspired the movie. The film is provided with a 1080p/AVC MPEG-4 transfer in the 1.66:1 aspect ratio. One of the most gorgeously photographed films in contemporary cinema, 'In the Mood for Love' comes to Blu-ray with an exquisite video presentation that doesn't disappoint. The source print is in excellent shape with only a few marginal specks here and there. A rich layer of grain is present throughout, giving the image a pleasing, filmic appearance. While certain shots can look a bit soft, overall clarity is nicely resolved, highlighting all of director and cinematographers' breathtaking compositions and dreamlike camera movements. The 60s period production design displays an immaculate attention to detail, and everything from props to sets and costumes are beautifully rendered. Colors are bold and moody, often bathing the screen in sensual hues. Maggie Cheung's intricately designed cheongsam dresses are particularly stunning, showcasing tiny patterns and sumptuous red, green, and blue tones that pop and dazzle. Contrast is well balanced with deep, inky black levels and solid shadow delineation. Famous for its striking cinematography, 'In the Mood for Love' makes the leap to high-def in style. Wong Kar-Wai's sumptuous visuals are wonderfully preserved, and while the picture isn't razor sharp, the artistry behind the film's images is remarkable. The audio is presented in a Cantonese/Shanghainese DTS-HD MA 5.1 track with optional English subtitles. Delicate but filled with auditory texture, this is an exceptional mix that subtly draws the audience into the film's achingly romantic mood. Dialogue is clear and crisp throughout with no pops, crackles or background hissing. The soundstage is gentle but wide, carrying a restrained yet fully enveloping sense of immersion around the room. Tiny atmospheric effects like background chatter, typing, phones ringing, or falling rain are all naturally spread throughout the front and surround speakers, adding a rich sense of character to the film's modest settings. Of course, the real highlight here is the movie's beautiful score, and the songs and music selections come through with moving fidelity and strong separation. Dynamic range is wide, providing a healthy, distortion free gamut between low and high frequencies. The film's use of sound is just as important as its visuals, and this mix is full of gentle ambiance. Spacious and delicately layered, this is a strong audio track that complements the movie perfectly. Criterion has put together a lovely set of supplements, including a making of documentary and deleted scenes. The extras are presented in upscaled 1080i with Dolby Digital audio and optional English subtitles (for the foreign language portions only). @ "In the Mood for Love" (HD, 51 min) - This is a loosely structured documentary that chronicles the film's production and evolution. Cast and crew interviews are interspersed with behind-the-scenes footage and lots of deleted material. Kar-Wai is infamous for employing a heavily improvised shooting style with no formal script, and the doc reveals just how much the movie's tone changed throughout its fifteen month shoot. Several light-hearted/comical sequences are showcased that did not make the final film, and while they wouldn't have fit with the finished movie's somber mood, they're quite amusing on their own. Deleted Scenes (HD) - Four deleted scenes, "Room 2046" (8 min), "Postcards" (8 min), "The Seventies" (9 min), and "A Last Encounter" (8 min) are all viewable separately. Optional commentary with the director is provided for the first three scenes. Unlike most excised material, these are all pretty substantial cuts that serve to fill in some blanks and extend the film's conclusion, following the characters further throughout the years. While they were wisely removed, the sequences are very interesting on their own, and further illustrate how the movie evolved over time, becoming more concentrated and focused. Unfortunately, the director's commentary is sparse and he doesn't address why the scenes were cut (though thankfully, he does elaborate on his reasons in later supplements). Hua Yang De Nian Hua (HD, 3 min) - A short film directed by Wong Kar-Wai composed of archival footage from classic Chinese movies is included. Wong Kar-Wai (HD) - An "Interview" (22 min), and "Cinema Lesson" (16 min) with Wong Kar-Wai are included. The director elaborates on the film's themes, characters, inspirations, visuals, evolution, and deleted scenes. He also provides some insights into his improvisational style and creative process. Toronto International Film Festival (HD, 44 min) - This is a Q&A with stars Maggie Cheung and Tony Leung at the 2000 Toronto International Film Festival. The actors discuss how they got involved with the project, what it was like working together, and how they dealt with Wong Kar-Wai's improvisational directing methods. Maggie Cheung provides most of the insights as poor Tony Leung seems pretty jet-lagged. Trailers and TV Spots (HD) - The film's American, Chinese, and French trailers are included along with an additional TV spot from all three countries. Wong Kar-Wai's 'In the Mood for Love' is a breathtakingly beautiful and impeccably performed exercise in visual expression. Fueled by images that softly burn with longing and romance, the film weaves a simple story full of palpable love and sorrow. The video transfer and audio mix are both exceptional, immersing the audience in the film's rapturous visuals and haunting music. Supplements are plentiful and insightful, offering fans a multifaceted peek into the movie's fascinating development. Criterion has really done an impeccable job here. This is a highly recommended disc for all film lovers, and a genuine must own for fans of art house cinema.